If you game online, like I do, then you've probably locked yourself into some program that helps facilitate your game. I've always been a big fan of MapTools and have been using it for years. There are quite a few new Virtual Table Top (VTT) programs coming out now and several are free to use. One of these that shows some promise is Roll20. Last Saturday my gaming group that normally uses MapTools switched over to Roll20 and from a player's perspective it was extremely easy to start up a game. Basically all we had to do was click a web link. That was it. Click on a URL and we were there. No need to add in a Ventrillo server for voice. No need to figure out IP addresses and make sure firewall settings were squared away. If you are trying to get someone involved in an online game that has never played with one before, you cannot find a simpler and easier way to do it than Roll20. 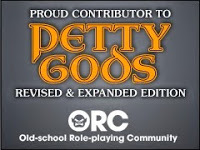 Roll20 is still in beta and actively taking feature requests on their forum. There were a lot of tweaks, bells, and whistles that I was missing from playing with MapTools, but to be honest, I had years of conditioning to overcome. For me the biggest issue was that I was used to using a Ventrillo server for voice and had everything set up so I'd click my middle mouse button to talk. With Roll20 I was "live" the whole time and that caused me some issues. Right now running a Roll20 game is much closer to running a tabletop game than a lot of other systems out there. Assuming you have a video camera and microphone (common if using a laptop) you can see and hear the other players. The program is best as a basic map, but there is a dice rolling function and it can play sound effects for the party. I prefer to roll my dice on the table next to my laptop and voice over the results, just like I would at the table. The program has a lot more features on the GM side of things, but I've barely checked them out. The only concern I have right now is that you have to work online. 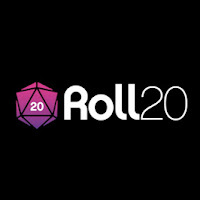 Everything resides on the Roll20 servers and you have to have an active internet connection to setup your files or to play a game. I've used MapTools with a projector for a convention game, basically creating a digital map, and I could not do this with Roll20. Still...the price is great and it has a lot of potential while still being very useful as-is. I recommend checking it out!